It is no surprise that I love to travel; however, I am not ignorant of the fact that most travel is not environmentally sound. In fact, according to environmental scientist, David Suzuki, CO2 emissions from aviation, alone, have increased 83% since 1990, representing four to nine percent of the impact of human activity on climate change. When it comes to diet, I agree with the 80/20 rule. I am of the mindset that if I "eat clean" most of the time, at least 80%, I can indulge occasionally and enjoy the treats that I still love to eat. I think we can apply a similar mindset to travel. Travel by air probably will never be environmentally sound, but there are things we can do to reduce your carbon footprint, nonetheless. Whenever possible, fly direct and pack light. Fewer takeoffs and landings and a lighter plane mean that you are helping in your own way to reduce the amount of fuel burned through air travel. Consider train or bus travel, and if you're a cruiser, investigate the changes that cruise lines are making to their design and onboard policies that make them more environmentally sound. If you're staying in hotels, opt for green hotels. Hotels can make a significant difference in sustainability and environmental affairs. Consider how hotels use water, service their landscaping, and manage their waste. Asking questions and knowing before you book help you make the best decision and support businesses more in line with your thinking. Use public transportation; this is a no-brainer. There are great apps that you can download and use offline for maps and scheduling. If you're renting a car, consider a hybrid, and bike or walk when you can. Shop locally. Buy from local merchants. Eat at local restaurants and avoid mass marketed chains. Support businesses that locally source their goods. Avoid souvenirs made with feathers, bones and fur. Leave the shells and stones where you found them; look at them, snap a picture for Instagram and leave them behind. Nature is not a free souvenir outlet. Watch your own waste. Reuse your towels and bed linens. When you're hiking, carry out whatever you carry into an area. Don't assume that biodegradable products will break down anyway. Even "natural" trash can cause harm while nature tries to keep up with the waste people leave behind. Use refillable, non-plastic water bottles; bring a filter if you're not sure about local water. Avoid disposable products when possible and use refillable travel size products to avoid weight and waste. For the most part, most of us want to leave this planet better for the next generation. By changing what we can and saving where we can, we have the opportunity to be proactive, rather than reactive. We can all make a difference in our own way. If you want to know where you can make a difference today, investigate your own carbon footprint by using a calculator like this one from the Nature Conservancy. 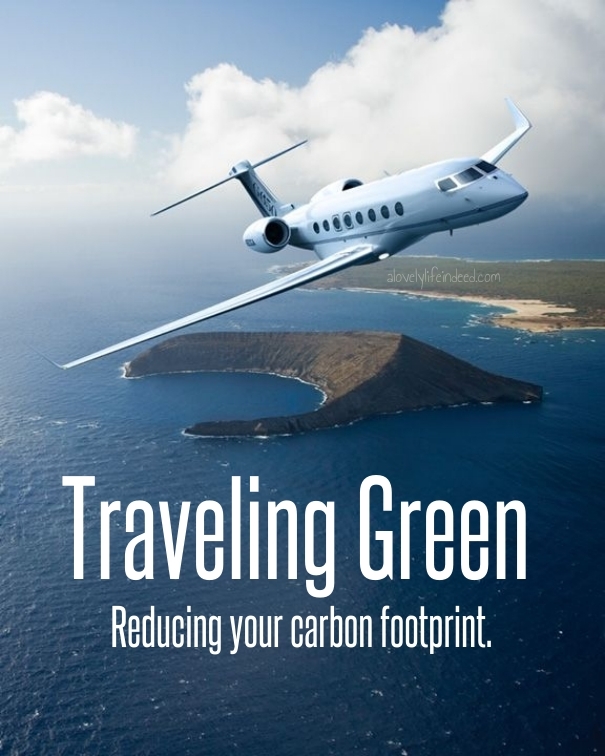 How do you reduce your carbon footprint when you travel? Happy Earth Day and happy travels! Great tips, Kelly! As someone who loves to travel, I have definitely thought about the environmental impact I'm having every time I fly. Except in the instances where public transportation is lacking, we tend to rely on getting around that way and I rarely go anywhere without my reusable water bottle any more. I'm also a huge fan of eating and shopping local as much as possible in general! I also think like this, although I've not given voice to it as you have. Thank you for this reminder today! We love train travel and public transportation. Sometimes it's hard to get where we want to go without a car, but we get ones that use as little gas as possible and walk as much as we can. Great tips! I really love traveling but I am aware what an environmental impact it has. So, any way I can keep traveling while being kind to the planet is a win-win! Happy Earth Day! traveling does have enviromental impacts, thanks for sharing these lovely tips!